Here’s the idea … with every product you use, rather than cleaning your brushes, scrapers, stamps, alcohol inks, etc with baby wipes or immediately taking them to the sink … place those unused, leftover bits of liquid materials and place them on the page in your art journal. When you need to clean off scrapers, scrape the leftover paint onto your art journal page to get off the majority of the medium, then clean your scraper. When you need to clean off daubers, stamp them onto your art journal page to get off the majority of the medium, then clean your dauber. When you have used a stamp and need to clean it off from its use, stamp it several times onto the page until no more images appear, then clean your stamp. Be sure to work from multiple directions, angles, and fill as much of the page as possible to achieve the greatest effect for your art journal. Allow colors, stamps, and more to overlap to create an haphazard layered look. ENJOY the process. This is a no stress, easy way that you can get MORE from supplies that would go down the drain or in the trash. 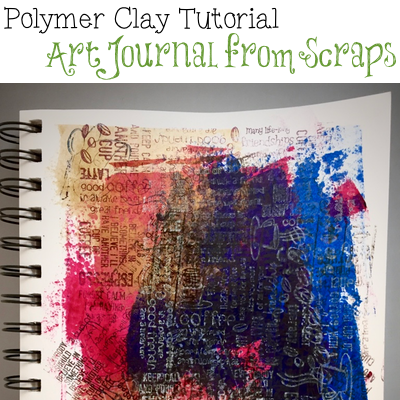 By then end of one of your sessions with polymer clay and mixed media elements, you will have a delightfully colored art journal page. This is a great way to fill up your art journal. Don’t forget that you can date the page and sign it to create a new “keepsake” of that special item you made in your studio!